Coral Connect - How to get a £20 bankroll boost when you get the card! Join Coral Connect with £20 to get started! Important – please ensure you follow these instructions in the order below, this will ensure you are eligible for the current free bet promo code at Coral. 3. 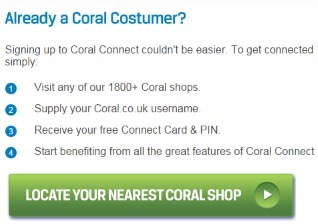 The key point here is that it explains how you can link your online Coral account to your Connect card. You need to do this bit at your local branch, just ensure you make a note of your user ID before you go there. 4. In the shop they will give you your free Connect card, and with your user ID they will be able to link it your online account. This bit is the important bit, as it ensures you will be able to make full use of the benefits of the card, such as being able to collect your online winnings in any of their shops. There is an immediate benefit at this stage, following new legislation earlier this year you now need to be registered and logged in with your Connect card to bet more than £50 on the shop fixed-odds betting terminals (FOBTs). By completing the process above you will automatically be verified and the restrictions will be lifted. Remember that the legislation is in part designed to prevent problem gambling, if you are concerned this is something that may be affecting you please take a look at the gambling help sites linked at the bottom of this page. Once you’ve got your card you’ll be ready to take advantage of the features it offers, so what can you expect? The main benefits to using it are currently the flexibility it gives you by integrating in-shop and online betting. It allows you to deposit cash in a shop and use it to bet online, or bet online and withdraw your winnings in shop. It goes further than most though, because it can allow you to operate your online betting account without a bank card. Some people prefer to bet with cash, using your Connect card gives you the option of putting cash into your online account and using that instead. If you do have a debit card linked to your account you can continue to use this as normal but in conjunction with the Connect card. Say for example you’ve got money in your online account and need some cash for the weekend, simple – just pop into Coral and withdraw it over the counter! Once you’ve signed up for your card you’ll be eligible for a number of special offers direct from Coral. So make sure your contact details are correct and that you’re opted in to communications, regular offers will be coming your way. These include deposit, “Bet & Get” offers, cash back and enhanced comp points online, plus exclusive roulette and slots bonus bank rewards that can be redeemed in any of their shops. As the Connect card integrates with your account online you will be able to use any of the products they offer. Fancy playing lotto, games or something different? Deposit in store, then play whatever takes your fancy wherever you may be – you can play all these and more on whatever device you choose. There are mobile and tablet apps, or simply via the website on your mobile or computer. Enjoy betting with Coral, we hope you make the most of the flexibility and benefits you’ll get when you collect your card.